My great-grandparents Mr. and Mrs. Daniel S. Ogle of Paola, Kansas, about 1910. In the summer of 1970 I was witness to a ritual that had eluded parts of my family for more than one hundred years. This ritual was the graveside service for my great-grandmother Mary Elizabeth (Kraus) Ogle (1886–1970) in a designated or an “ancestral” family burying ground. [i] By this late date, most of my family had revolted against the idea of “family plots,” preferring instead their own unique nomadic burials during the nineteenth-century westward expansion, or, perhaps later, in efforts to escape the Dust Bowl of the 1930s. There were a lot of reasons for this line of thought. For my ancestors, death was an unwelcome tradesman who stowed away on board the wagon trains affording little opportunity for anyone’s return ticket home. It wasn’t practical or affordable, and in the earliest of years it wasn’t even possible. No, it was just easier to simply honor our loved ones in the place where they had taken their last breath and then literally move on. The funeral of my great-grandmother that summer provided a reversal or a turning point in that custom. While Mrs. Ogle’s time on this earth had been humble, her funerals were not. Passing away in Long Beach, California, she was given perfunctory funeral services there, but her remains were then flown back to Kansas for a more formal “showcasing” of her life’s events. In Kansas, a florid funeral service ensued along with the summer’s heat. As a very young man I remember being somewhat confused by her two funerals – an obligatory West Coast stint and an American heartland ritual. Years would pass with my grandmother’s words about family cemetery plots echoing in the far corners of my mind. By the mid-1990s I began to wonder if there wasn’t something to the idea of “family” cemetery plots back in Kansas? I began to ask about any “family” cemetery plots. No one knew anything. The family was still practicing their proud old ritual of being interred where they died, so it really didn’t seem to matter if there were any “lost” plots in Kansas. I decided to contact the local cemetery authority for the city of Paola, Kansas. I would put this rumor in my head of a family burying ground “to rest” once and for all. 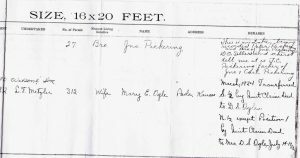 I inquired how I might go about claiming these plots on behalf of my great-grandmother’s family – I had little to prove any claim to them. The city graciously informed me that, since my grandmother was an only child, if I could provide proof of lineage from her then a simple letter to the clerk’s office would suffice. I immediately furnished the clerk with these proofs and a list of descendants – I wanted to make sure to keep my humble ancestral burying ground connected to the heirs of the woman who sacrificed to set it up in 1932. Now, I must tell you in the late 1990s no one in my family wanted to be buried in rural Kansas. And true it is that greed is a funny thing. A murmur in the family began to circulate that the seven remaining plots should be sold back to the city of Paola. I could see the dollar signs glimmering in the eyes of many of my kin. Reluctantly, I went back to the city and asked them, could the plots be sold back to the city? 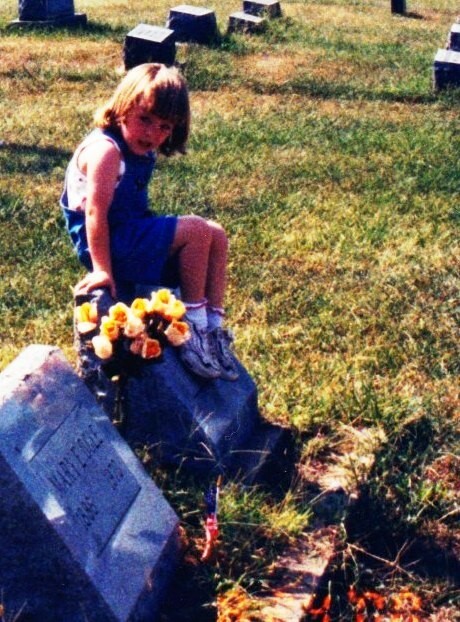 An Ogle great-great-granddaughter helps place flowers and flags at Daniel and Mary’s gravesite circa 2000. Needless to say the plots immediately became available again for family use – and oddly enough there is a renewed interest in the old ancestral burying ground. Imagine that! [i] Funeral notice for Mrs. Mary Elizabeth Ogle, The Miami Republican, August 1970. [ii] Family recollections of my grandmother Katheryn Ogle Record (1914–1993). 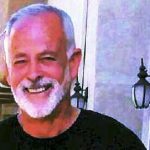 [iii] Findagrave.com memorials no. 35234298 and no. 35434243. 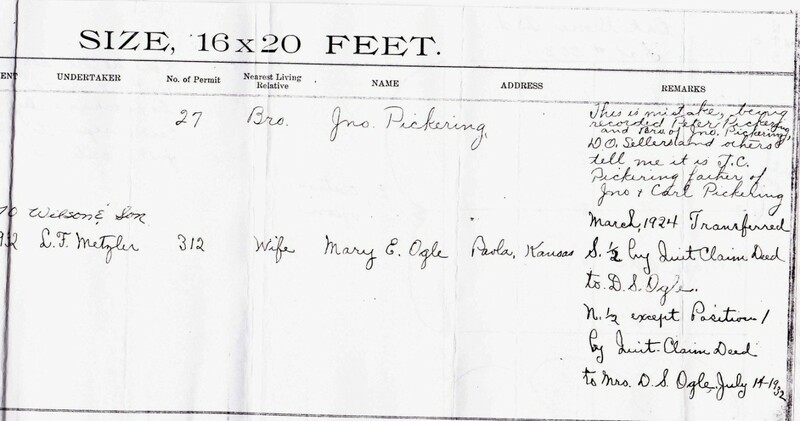 [iv] Correspondence from the City of Paola, Kansas, Jill Holmes, City Clerk, 25 March 1996. Five generations of my husband’s family are buried in a cemetery in Northern NY. Even though we have lived most of our lives in Florida we plan on placing a maker for us in that cemetery. Our ashes won’t necessarily be there, but we want to make it easy for our great great grandchildren to connect us to the family. We purchased extra lots in case anyone else in the family wants to join us. Paola, Kansas is more honest in its dealings than Macksville, Kansas where my great-grandparents,Courtland Richard Case and Anna Russell, their daughter Eva,with her first husband, my grandfather, Robert Emmett Aiken, lie. I was told by the Town Clerk that although our family has four remaining plots, the bodies of all would be removed fifty years after the last burial activity. This is one of those “What would you do? stories. I did nothing and time was up in 2012, fifty years after my grandmother’s death and burial. Carol, I am so sorry that happened to you and your family. 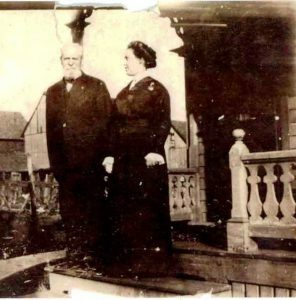 Sometime after my grandfather died in 1961, my dad as his executor got a query from Elmwood Cemetery in Detroit about a multi-party plot bought for family use by Grandpa’s future father in law in the 1890s as I recall. It turned out to be a nice moment for Dad to get in touch with long-lost cousins, all of whom, as heirs, needed to sign off on the family plot, which we “sold” to Elmwood for the exact cost of perpetual care thereafter. Haven’t dropped by to see if they’re keeping up their end of the bargain! 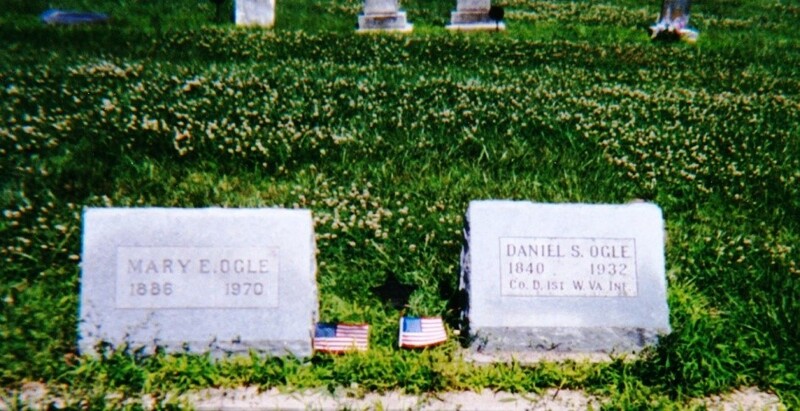 My maternal grandfather purchased 8 plots (I believe) in a Coffeyville Kansas cemetery; even had a large stone from the front yard of his house moved to the cemetery and the family name carved on it. Lots of snapshots exist of various groups of children sitting on that stone on Decoration Day (as we called it then) trips to the cemetery. He was buried there in 1945, and the next burial there was his widow, 45 years later. I recall my grandmother sitting on the big stone saying to my husband, “There’s plenty of space here, if you want to use it.” As it turns out, of her six children, only one is buried there, my mother and her husband. Four plots left, and I don’t think her son-in-law will accept that offer either. There is a whole story of cultural change here, as each generation develops burial practices suited to the circumstances of their own time and circumstances. There is something lost, but I think perhaps there may be something gained as well. I had been close to my grandmother all my life, but was unable to be present when she died. She was buried 1000 miles away, next to her first husband, who’d died when my father was still in high school. Some decades later, I went to visit their graves. What I didn’t know is that the same cemetery held graves of dozens of family and collatoral relatives. A missed opportunity. (Now I know to check these things first!) My own parents felt that funerals and burial was unnecessary foolishness. My brothers and I carried out their wishes to be cremated, and their ashes spread at the headwaters of the Rogue River in southern Oregon. That way, they said, they would become part of everything they loved about the place they lived: the trees, the fish, the earth, the birds, all of it all the way to the ocean. I missed the lack of a place, a stone to mark their passing. But I came to understand why they made that choice. I live 3000 miles away now, and yet every time the wind blows, or it rains, or a bird flies over, I feel that my parents are nearby. They have become part of everything around me. Two of my brothers are dead, and they had made similar choices for themselves. I am not sure I will. I belong to the earth, and wish to be part of it. With a headstone that will gradually weather into the earth, as I will. Beautiful and bittersweet thoughts and recollections Annie – I could not agree more. What an interesting article. I have many relatives buried in KS and alot of them would be buried in a common area and then a name added to the back of the first buried’s tombstone. I guess it isnt really important to some where the actual body lies. Alot of people there were just poor dirt farmers and a tombstone was quite above their means. I have so many dissappearing relatives that I am always happy to find a gravesite with a marker.